Wednesday morning we left Tucumcari, New Mexico and headed east toward the tiny hamlet of Hughes Springs where I was raised. Since that time I have been running off -grid because apparently my folks farm is surrounded by a low-level dampening field blocking all internet signals. Today, though, we ventured out to McDonald’s restaurant in the neighboring village of Daingerfield. McDonald’s has free wi-fi if you buy a soda. Here are some highlights of the last couple of days. 1. Cadillac Ranch–two really exciting things happened in Amarillo, Texas. 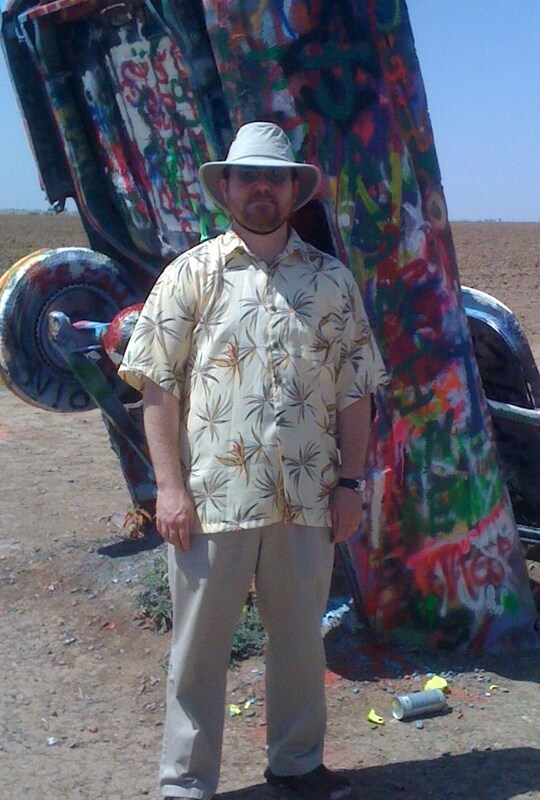 The first one is that we stopped at the famous Cadillac Ranch. If you’ve never heard of this, it is a row of planted Cadillacs in the dirt like flagpoles, hood down. It is quite odd. It has been this way since the ’70’s and people now come and spray paint, write, and see the famous Caddies. It is closely akin to Carhenge, a place we saw last year. The difference is that the Cadillac Ranch is not tied to any commercial venture. No one is making a dime off of this. It simply exists. 2. The Big Texan–Also in Amarillo is the Big Texan steakhouse. This is the original famous “if you eat its free’ steak. If you eat a 72 ounce steak and all the fixins in less than an hour, it is free. Of course, they make you pay ahead of time. Now, to keep you from wondering, I did not attempt this. We did eat steak, but not that much. It was quite a Route 66 tourist trap but we loved it anyway. 3. The Coming Light Bulb Apocalypse–Yesterday I “carried” my mother to the store to get a bill of groceries to feed my family for the upcoming week. While we were there, she bought a box of light bulbs. I asked her why–those weren’t on her list? She said it was because in January they were no longer going to sell “real” light bulbs and she wanted to stock up. She buys a box every time she goes to town. I told her she would be fine, that they were only replacing those with more energy-efficient and longer lasting light bulbs but she informed me those cost $7 a bulb and she wanted to stock up. Then when checked out, she started in on it again and preached a sermon about the coming days when people would miss the old light bulbs. She said, “When that time comes, you’re not getting any of mine!” Another woman left the line and went and picked up a box, nodding her head mumbling something about ‘being prepared.’ My mom announced she is going to store them in a ‘safe place’ out in the canning shed. This light bulb thing matters to her a lot. She did the same thing today when Mrs. Greenbean and I took her to The Wal-Mart. I confess I am woefuly unprepared for the coming light bulb apocalypse. For the record, Griff and I did the environmentally responsible thing and replaced all our lightbulbs and promptly melted some wire in the fixture in our bedroom. The landlord had to come replace the whole thing and he bought us a few packages of the old ones and kindly asked us to change them all back. So your mom is onto something. It hurts my conservationist soul, but here we are. yeah, i hope this new layout is better. i still need a better gravatar pic, but then i don’t have much raw material to work with. my mom is so funny about the light bulb thing. i am going to send her a giant box of light bulbs for christmas. oh, and did your landlord get angry? i was just wondering.